Don’t look now, but the summer months are creeping up quickly. That happened fast, didn’t it parents? At Kidstown Learning Center, we are already preparing for the summer season, which means our Lake Worth summer daycare program is now open for enrollment! If you’re looking for more than a place to leave your child while you’re at work, then consider our Lake Worth daycare for a number of reasons. First of all, Kidstown Learning Center is a place for your child to learn and grow — whether it’s through our infant child care program, our toddler daycare, or our top-of-the-line Lake Worth preschool programs. But the fun doesn’t stop there. We are also known throughout Lake Worth, Boynton Beach, and the surrounding area for our immersive, fun, and downright enjoyable summer daycare for kids of all ages. 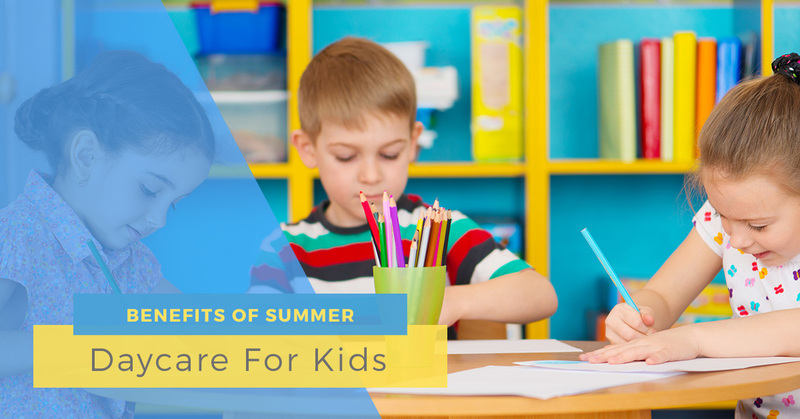 We fill our summer program with an incredible amount of fun and learning so that your child can continue to thrive even when they don’t have a school structure to keep them busy. 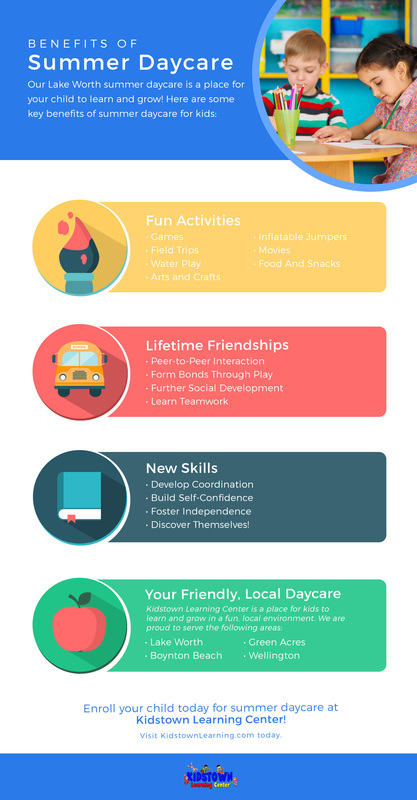 So what are some key benefits of our Lake Worth summer daycare for kids? Take a look at just a few and contact Kidstown Learning Center to sign up today! We provide breakfast, lunch, and snacks for all children at our summer daycare, so you never have to worry about them not being taken care of! At Kidstown Learning Center, we’ve seen lifelong friendships and bonds formed during our summer daycare camps. This is a wonderful opportunity for your child to interact with friends both new and old throughout the course of the summer. This social interaction not only promotes happiness within your child, it also further aids with their social development and ability to make friends on their own. Of course, as a place for your child to learn and grow, we also want to cultivate an atmosphere which will aid with your child’s development — even if it is only for a summer. Through games and peer-to-peer interaction, your child will continue to develop new skills and improve on old skills, including math, coordination, teamwork, self-confidence, and a whole lot more. Some parents think that sending their kid to summer daycare or summer camp will only make them more of a loner. However, this is not true! Kids who attend summer daycare camps are actually found to foster a sense of independence, as they learn how to make decisions for themselves away from their parents and ultimately deal with those lessons and consequences, whether good or bad. Summer daycare is a place for your child to truly discover who they are! Finally, the reason why you should consider Kidstown Learning Center for your child’s summer daycare needs is because we are local. We are proud to serve Boynton Beach, Green Acres, Wellington, and of course Lake Worth as the best local daycare in the area. Contact Kidstown Learning Center today to learn about how to enroll your child in our summer daycare program.